Until very recently Cedar House patients had to travel to Canterbury to indulge their passion for music. However, earlier this year, the hospital decided to invest in our own music capabilities to enable more patients to take part, more often. Cedar House now boasts its own music room in a dedicated building with a range of instruments; drums, keyboards, guitars, bongos and even DJ decks. We also have our own music lead, professional musician, Douglas Mukuze, who ensures that patients can progress and develop their musical abilities. There are ten patients who play as regularly as possible, all of whom have been taught from scratch. For patients with intellectual disabilities, many of whom may have had negative experiences in formal learning environments, learning an instrument can seem quite a challenge. However, having worked with us as a support worker previously, Douglas has an in-depth understanding of our patients and their needs. He usually teaches them to play ‘by ear’ and the results are astounding. Sometimes he will simply accompany patients, for example, he plays keyboard whilst one of the patients plays drums. Sometimes patients play covers, other times their own compositions. It is completely their choice. The therapeutic effect of music in terms of mood, behaviours and general positivity are well known. 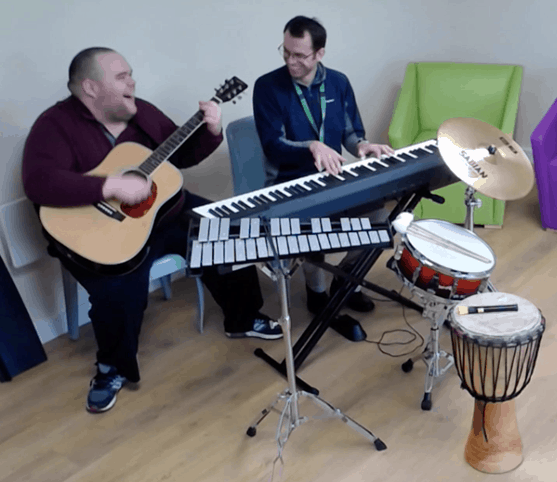 For our patients, some of whom have some quite challenging behaviours, the opportunity to simply come and bang on drums can help elevate mood and moderate behaviour. For those who are passionate about music, we’re really proud that we’re able to create an environment where they can pursue that passion. Above all, we look forward to seeing them progress and perform at the many events at Cedar House.